Thank you for visiting my page. I hope you enjoy your stay. It's a little of this and a little of that. It is my first webpage. There will be improvements as I learn. 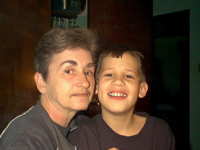 Above is a picture of me with my grandson. He is eleven years old at the time of this picture. And the joy of my life. He is into WWF Wrestling. He is always demonstrating new holds for me. This year Joseph signed up for biddy wrestling. I have two daughters-Crystal is the youngest. She is suffering from acute renal failure. She is presently on the emergency transplant listing. UPDATE FOR CRYSTAL-She has successfully undergone transplant surgery. She is doing fine. UPDATE FOR CRYSTAL-Crystal has now joined the working force, has her own car and become engaged. Jasmina(Jas for short) is Joseph's mother. She has her hands full with him. I like fishing and hiking. They sort of go together. If you want to catch the big ones you have to go hiking. I especially like bass fishing. Sometimes they can be sly devils. But with patience you can catch them. I love going to car shows. The muscle cars are my favorites to see. I think it is totally awesome what can be done to an old car. I think the muffler wraps and burnouts are super. The more noise they make the better I like it. Our town has a cruise every August. Sometimes there are over 1500 cars. This year the "LAW" put a damper on things because of the newly paved roads. Of course there were the defiant ones. Those who got caught received $150.00 fines. I work in a garment factory as a floor girl. I maintain from 9 to 24 girls. I have to give them their work and take away what they have finished. The girls can keep me hopping. 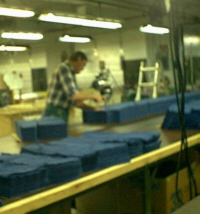 This is Jack in the cutting dept.. And Pam in the hemming dept... There is an update to this portion. The garment factory has locked the doors on it's employees. A few of us have gone on to other jobs. Some of us have chosen to continue our education. I am one of those. I'm taking a course in Medical Assistance Science and I hope to graduate in July of 2004. The gentlman (Jack) above has gone to another job. The girl (Pam) pictured above has gone to nursing school. So maybe down the road a bit our paths will cross again. Another update( Sept/2005) to this is now I have an Associate Degree in Medical Sciences and Pam has finished with her nurse schooling. I have a small ceramic business. I sell finished pieces at craft shows. Some of the shows are by invitation only. I also take private and special orders. At the moment I am working on a tombstone for my friends St. Bernard that passed away. When I finish it I will put a photo on board. I used to display my items at this store. It is located in Shenandoah, Pa. The store has crafts all year around and carries quite a variety of hand crafted items. Last year(1998)I was "featured artist" of the day. I had to demonstrate my wares. It was a fun day for me. I entered my "CAROUSEL"(has lights, mirrors, music, jewelled horses, and turntable). It brought me "Best of Show" and "First Place". It was a timely project for me but the ribbons were worth it. This year(1999) I entered my "Fighting Eagles" light. As you can see it brought me a honorable mention. I have to get the wheels turning to plan next years project. Located in New Ringgold, Pa., it is a science and nature orientated store. I display my animal things(wolves, eagles, elephant, Southwestern, etc.) at this place. There are learning classes for a number of things. This is my entry for the fair this year. I won first place. It is a water fountain. The top three pictures are the components. The bottom pictures are the finished product. I am truly happy now with my accomplishments in ceramics. My dream was to get a blue ribbon for one of my eagles. I have now attained that prize. So now I will lay down my brushes and take up a new hobby. Amazing Drag'n Drop Animal Puzzles THIS IS TOTALLY AWESOME. Click on Matt's link below to see his amazing work. Play Trivia Blitz here. It's a fun game and you can win prises by signing up for membership. I like playing Puzzle-A-GOGO. Bingo Blitz has a good jackpot. I hope you hav enjoyed your visit. Cadrap's Eagle Domain-This is my page about the bald eagle, my bird. I won an award for this page. Check out my free greeting cards. There may be one you would like to send to a friend.